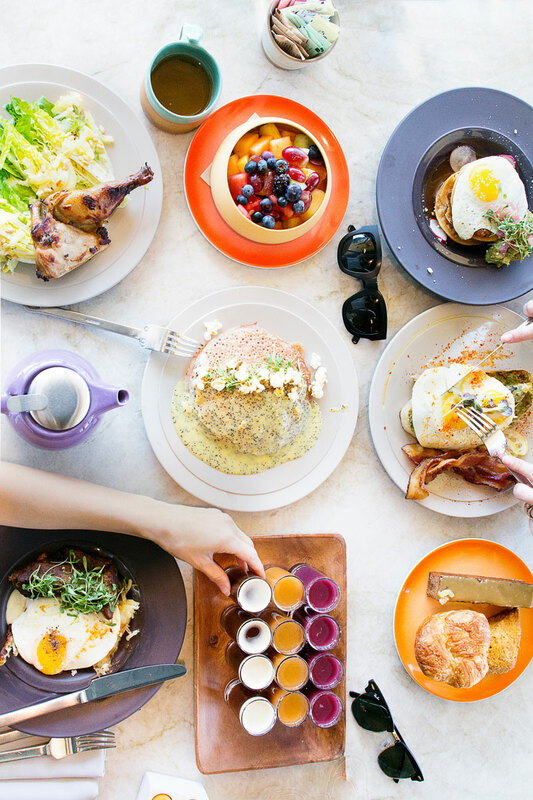 Your guide to the Scottsdale food scene. 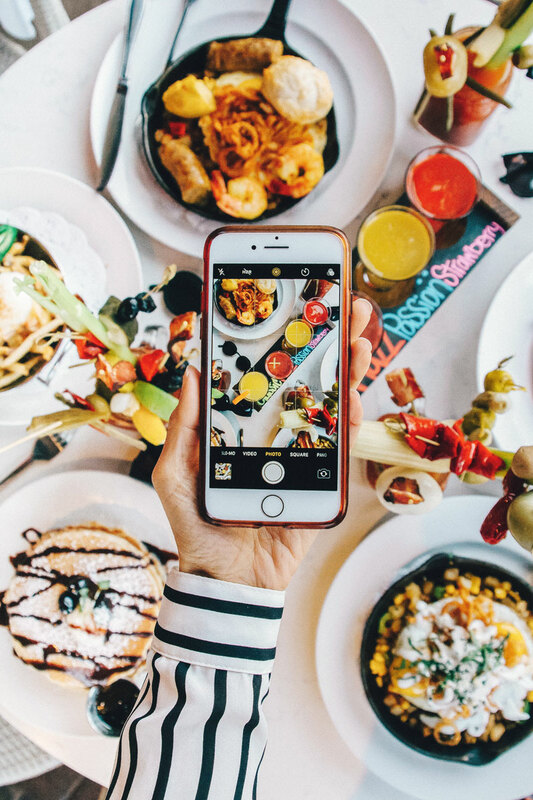 Here’s everything you need to know about where to go to eat the most Instagrammable and delicious dishes in Scottsdale, AZ! 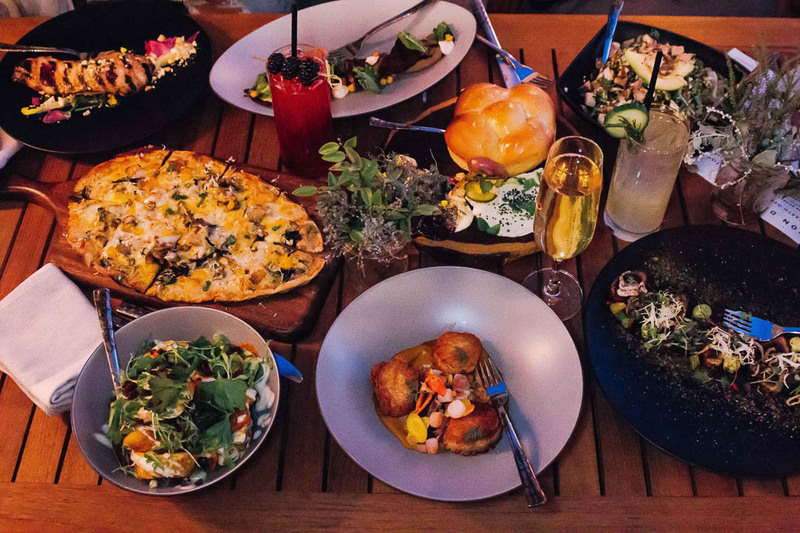 The food scene in Scottsdale ticks all my boxes – beautiful spaces, Instagrammable food, great service and of course food that is tasty enough to match appearances! I just can’t even begin to describe how much fun we had eating our way through the city. 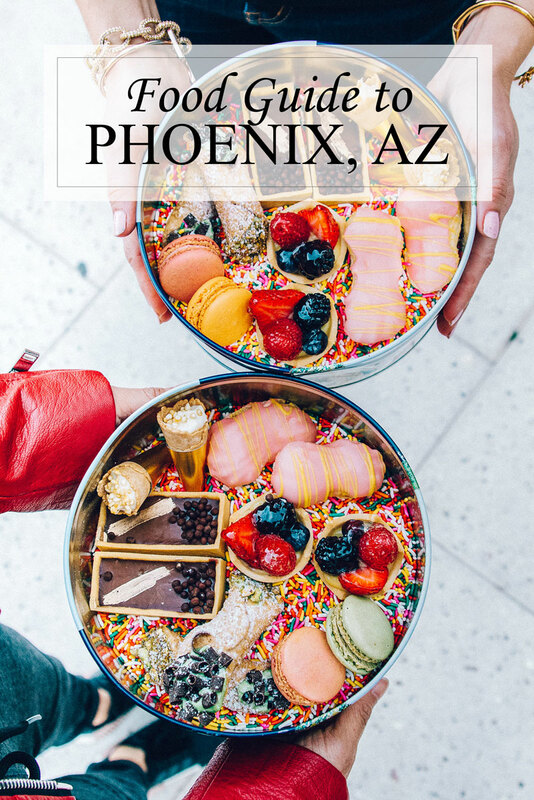 Read on for where to eat in Scottsdale, AZ…. 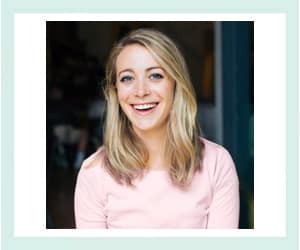 I still dream about their brussels sprout nachos and I’m dying to recreate the recipe for the blog – and my belly. TIn case you’re wondering, that beautiful pink topping you see is a delicious beet crema – the perfect finish for this healthy-not-healthy dish. 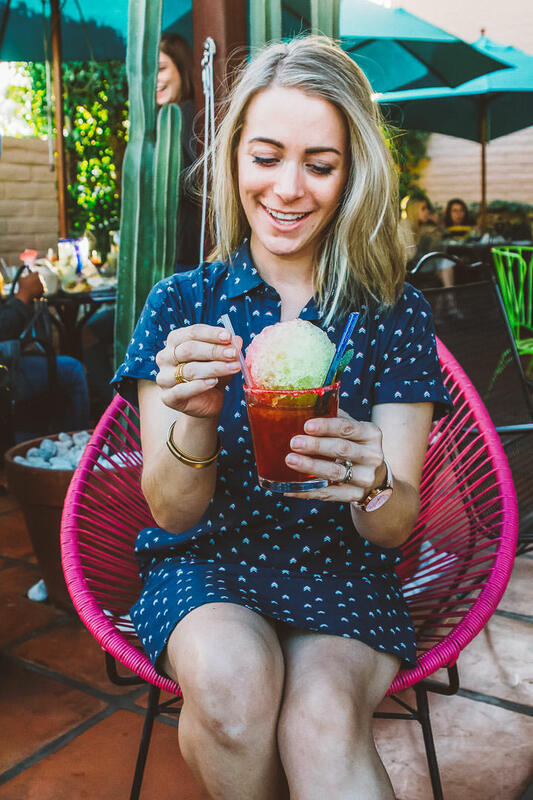 From snowcone cocktails to colorful tacos, eating the rainbow has never tasted so good. The decor at Diego Pops is also on point with bright colors, fun signage and this awesome neon pineapple wallpaper. The Phoenician does casual lux with a farm-to-table spin at their restaurant Mowry & Cotton headed by Chef Tandy Peterson. Their extensive menu features thoughtfully created dishes that are beautiful and delicious. There’s truly something for everyone – from heavier dishes like bison and ribs to lighter fare for the vegetable-loving crowd. For dessert I highly recommend their s’mores pie which is a deep dish of chocolatey and marshmallow-y goodness. You can choose to eat inside in their chic newly remodeled restaurant or dine al fresco with views of the stunning Phoenician pools (as seen in my Scottsdale pool guide). 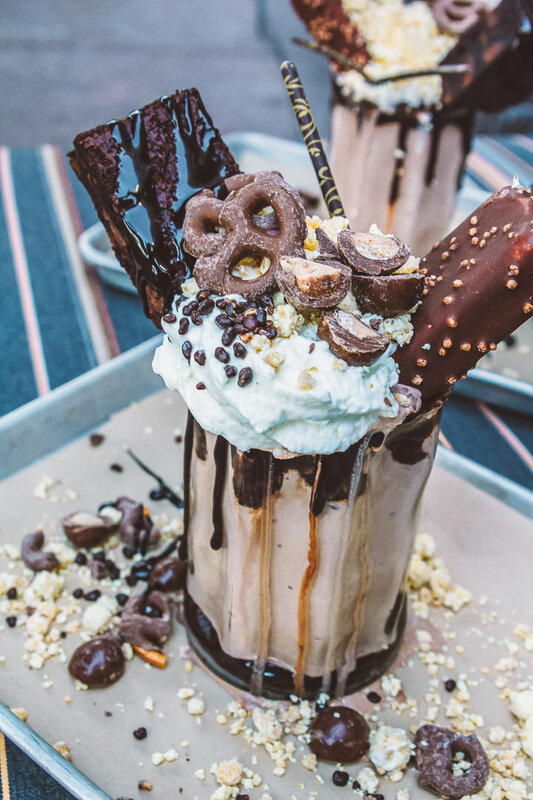 If you’re looking for the most Instagrammable food in Scottsdale, it might be the Showstopper Milkshake at Zuzu restaurant located in Hotel Valley Ho. 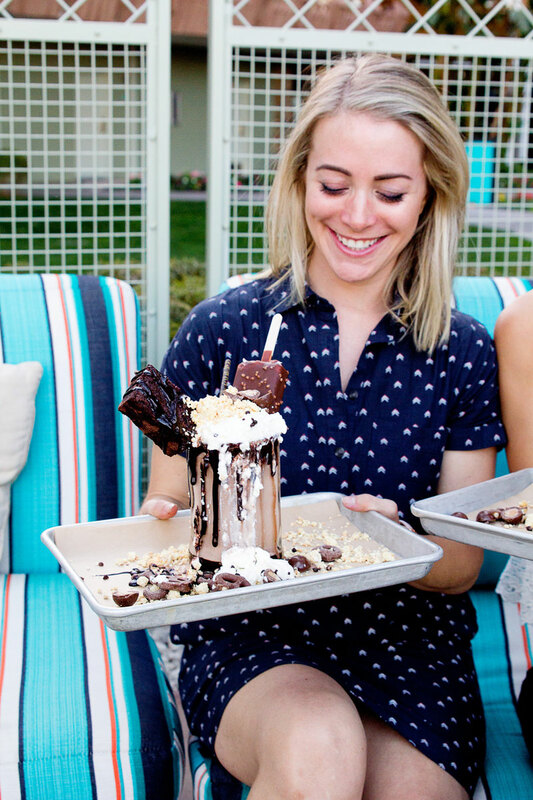 The over-the-top freakshake is constantly changing but ours had chocolate covered pretzels, brownies, an ice cream bar, Whoppers, and more! 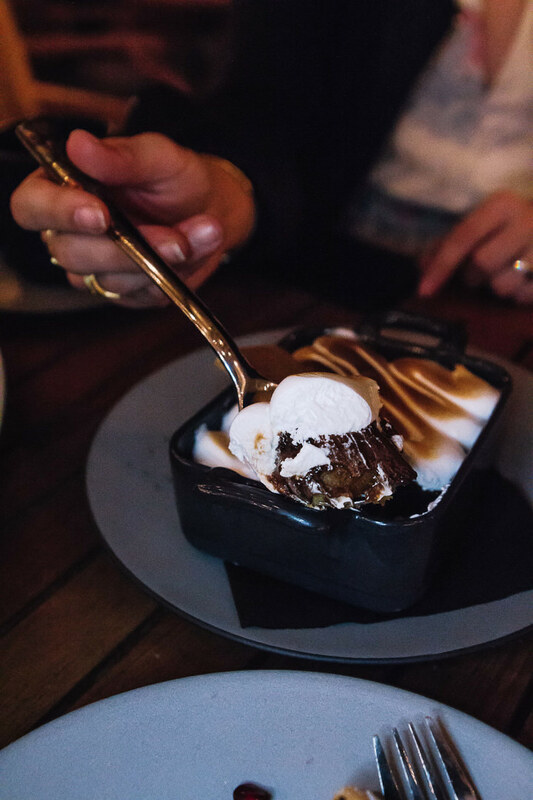 It was totally decadent and so fun to eat (and photograph – let’s be serious!). Weft Warp Art Bar offers a chic brunch or lunch option in a modern but still comfortable setting. 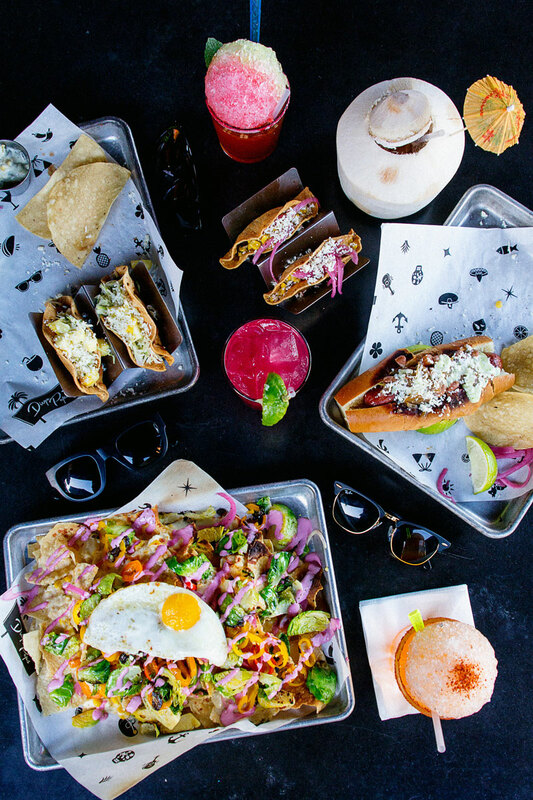 Their menu includes many healthy brunch options with a few splurges and many have an innovative southwestern twist. 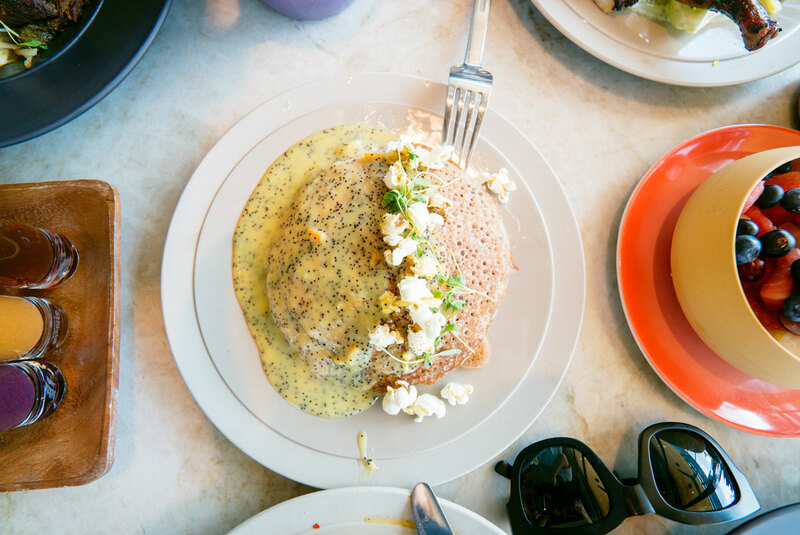 I’m still dreaming about those blue corn pancakes! The Hyatt Andaz team has really outdone themselves with decor and the way the incorporate local artisans into the decor of the entire hotel. The art in the common spaces and nick knacks are all beautifully unique and made locally, meaning the Art Bar truly earns its name. The staff even wear beaded bracelets made by a local artist. They also made my list of Scottsdale pools to check out as well! Even if you’re not staying at the Hyatt Andaz, this is definitely a must check out if you’re in Scottsdale. The build-your-own bloody mary bar at Hash Kitchen in Scottsdale is epic. It has dozens of options and creating your own drinkable work of art is almost as fun as consuming it! If you’re looking for a truly spectacular creation, make sure you ask the staff at Hash Kitchen give you tips. We ended up with a bloody mary shaped to look like a face! 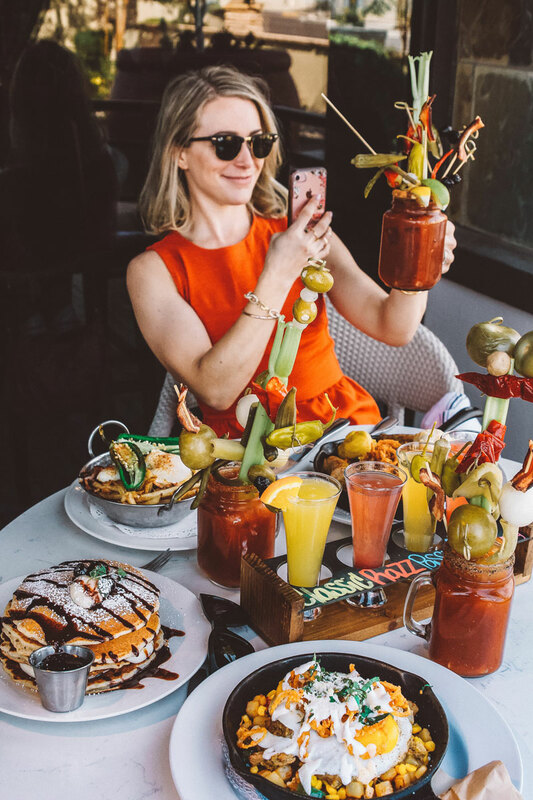 In addition to the best bloody marys in town, they also have a full brunch menu of unbelievably delicious (and colorful!) options from sweet to savory. Headed to Scottsdale? 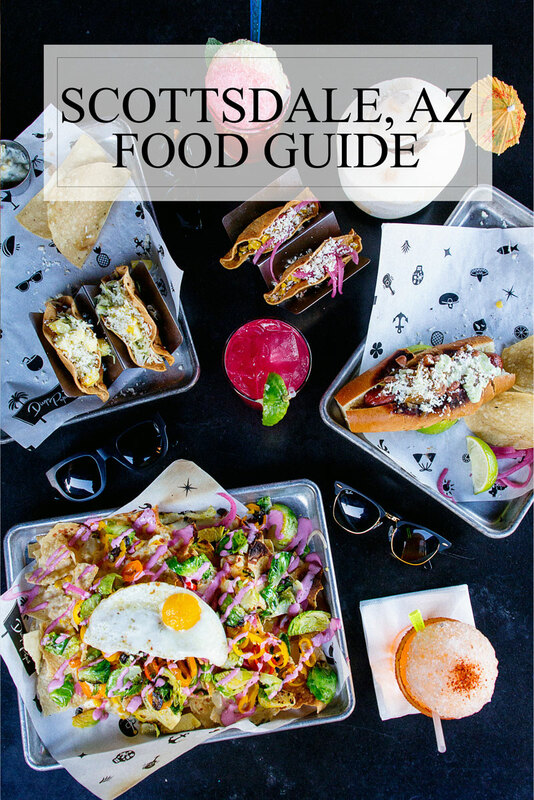 Pin this food & restaurant guide for later!